The iPad is considered the most successful product lunch in history. So it is not a surprise (well, maybe it is) that Steve Job took a break from his medical break to announce the iPad 2 to the world. The iPad 2 goes on sale March 11 and is expect to sell out very quickly. Are you planning on buying one? I know I will. The updated iPad is significantly thinner than the outgoing model. The iPad 2 is even thinner than an iPhone 4! Weight has been reduced as well, with the new model coming in at only 1.2 lbs. Specs wise, the new iPad has a dual-core A5 CPU that is up to two times faster than the old iPad. The story is in the graphic. The iPad has up to nine times faster graphics. A new front and back facing camera allows videos and pictures taking and white has been added to the color choice. 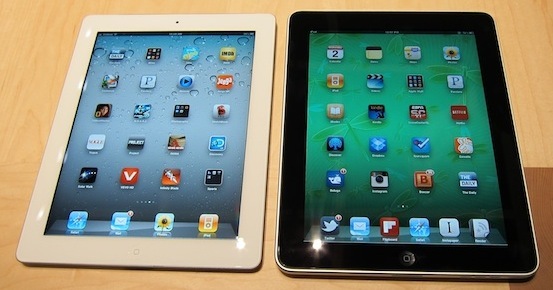 Here’s a white iPad 2 side by side to an iPad 1. Overall, the iPad 2 is a worthy update to a game changing product. Apple will face stiff competition this year from other tablet makers. Only time will tell if the iPad will remain at the top of the heap.